Horror readers especially, do not care if a book is brand new. They just want something compelling, that makes them feel uneasy, and that will invoke terror. They are among the most willing readers of backlist titles. In my experience as long as the scares are good, they will read anything. To that end, I am going to start a semi-regular feature here where I will highlight either backlist authors or specific backlist titles. All of these posts will use the label "backlist not to miss," so that you can access all of the posts at one time. Today I want to highlight the work of Tananarive Due . Due is an author of character driven, suspenseful horror titles that appeal to a wide audience. The tension is palpable and there is violence in her novels, but as horror goes, it is on the less graphic end of the spectrum. The fear and terror are invoked through the oppressive atmosphere and the horrific situations into which our characters are placed. I often take readers who enjoy Stephen King , Dean Koontz , and John Saul , but are looking for something new, to the shelf with Due's titles. I have yet to find a reader who knew about her before I brought them to "DUE." I also always try to start these readers off with My Soul to Keep (1997). In this compelling novel, a 500-year-old African immortal man is living in modern times as David, a jazz scholar in a middle-class family. He has had many lives and loves throughout his long life, but his current situation as husband to Jessica and father to Kira is extremely satisfying. However, David's original family of immortals asks him to sever all ties with Jessica and Kira in order to save their kind. It is David, the tough choices he is forced to make, and the fury of his original people that drives the story here. This novel is one of my tried and true horror suggestions so people looking for a good scary book. I have given this backlist gem out to at least a dozen readers over the years and have yet to find an unsatisfied patron. In fact, hand selling this title to people has helped me to forge a deeper relationship with patrons. They have often returned to express their gratitude; this just happened most recently in November. Their pleasure with Due's novels lead them to seek out our staff's help more regularly. It is a win-win situation for us all. Good backlist options do just this. They highlight both your collection and your staff. This reminds patrons of how indispensable you are. 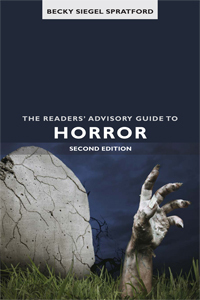 To that end, look for more "backlist not to miss" horror options coming soon. “Libraries fed our passion as children, and feed it still.” --Cynthia Kadohata.